Savencia Fromage & Dairy consists of two complementary activities that are both built on adding value to dairy resources. Fromage, the Group’s historical business, is focused on producing high quality, high added value specialty cheeses, in Europe and worldwide. Dairy which brings together all other dairy products – butter, cream, aseptic technology long-life dairy products and ingredients – and markets them internationally. The Group is one of the few processors worldwide capable of producing all the different families of cheese. We pay careful attention to variations in taste, changes in use and lifestyle and continually reinvent our cheese to satisfy consumers in all their diversity. We adapt to local tastes and consumption habits to remain as close as possible to our markets. Savencia Fromage & Dairy produces butters and creams for retail and the catering and restaurant professions, as well as dairy ingredients for the food, nutrition and healthcare industries. Our leading brands include Elle & Vire, Corman, the market leader in technical butters, and Armor in the field of dairy ingredients. The Group was founded on innovation in specialty cheeses with Caprice des Dieux. Since then, the group has innovated continually in order to develop unique brands for its markets. In developing new flavors, new textures, new properties, etc., our innovation and marketing teams use the very latest technology to meet consumers’ expectations in terms of enjoyment, practicality and nutrition, and to adapt to their new lifestyles. Every one of our teams shares the goal of guaranteeing our renowned high quality to consumers. We take into account every aspect of quality: appearance, taste, consistency, ease of use, enjoyment, nutritional value, health benefits, preservation, packaging, service and price. Our products are assessed by panels of consumers and staff, who are specially trained in sensory analysis. Our quality assurance policy covers the purchase of raw materials, production and distribution. It complies with the strictest international diagnostics and food safety protocols. Our products lay proud claim to their origins and differences as the source of the richness and range of their flavors. 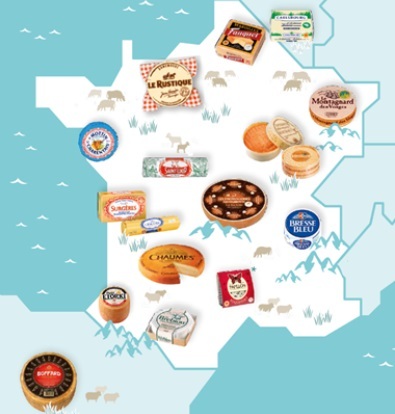 In every country where we produce cheeses, butters or creams, we choose the best regions for our facilities. The authentic nature and distinctive flavors of our PDO* products demonstrate the effectiveness of this approach. Maroilles Fauquet in Thierache, Epoisses Berthaut in Bourgogne, Carlsbourg in the Belgian Ardennes and Lescure’s Charentes-Poitou butter. This enables us to meet the increasingly high expectations of consumers for authentic regional products. Our expertise covers the distribution of our products thanks to the organization and presentation of our aisles, our management, promotion and training. We put forward complete sales solutions, adapted to suit the distribution circuits of the stores involved like Dassault Systèmes’ Perfect Shelf® 3D merchandising system, an innovation which makes it possible to immerse yourself in virtual reality in a store or a specific department. With a presence in 120 countries, our sales teams are renowned for their effectiveness and expertise. In 2017, Savencia Produits Laitiers France’s sales team maintains its second place within the Advantage Group classification for the Fresh Dairy category. It also won an LSA Trophy for Sales Force Performance, for its geo-merchandising tool facilitating customer’s in-store experience while optimizing the use of space. Located at the heart of France’s Rungis national wholesale market since April 2015, the business unit ‘Comptoir du Fromage’ is dedicated to cheeses with regional origins. Its vocation is to commercialize product ranges designed for traditional cheese retailers in France and to support and develop regional brands typifying French regional cheese-making expertise. 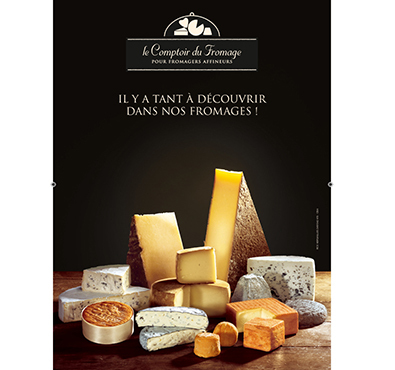 For restaurant owners and export markets, the Au Fromager de Rungis* website offers a comprehensive range of traditional cheeses. Thanks to their natural nutritional benefits, cheese and other dairy products occupy a unique place in an everyday balanced diet.